Let’s celebrate the messiness of writing. And yes, I’m guilty of it too. It is important for students to know the steps of the writing process (i.e., collecting, developing, drafting, revision, editing, publishing, reflection). But it’s also important for them to know that these steps aren’t orderly. For instance, a student might be collecting a seed idea in his or her writer’s notebook, but when they confer with their teacher, they revise. This is part of the process. Let’s look at one of the hardest lessons for students to learn: editing. Editing shouldn’t be something writers save for the day before publication. Remind your students that writers are constantly editing. Yes, they’re polishing their writing by proofreading it before taking it to publication, but editing is a daily task. Process logs don’t have to be detailed. Students can quickly log what’s easy, what’s hard and/or what strategies/tools they used as a writer on any given day. At the end of a unit of study, students can return to their process logs looking for patterns and stating what they noticed. This helps each student identify a process that works best for him-/herself. This matters because children who understand how they work best as a writer can replicate their writing process again and again across genres. Before tasking students with keeping a process log, it helps to have tried one yourself. Pay attention to yourself as a writer for a while. Once you understand yourself as a writer, you’ll not only come to understand your process, you’ll be equipped to have meaningful writer-to-writer conversations with your students about the writing process. I often use an image like the one above to remind students just how messy the writing process can be. 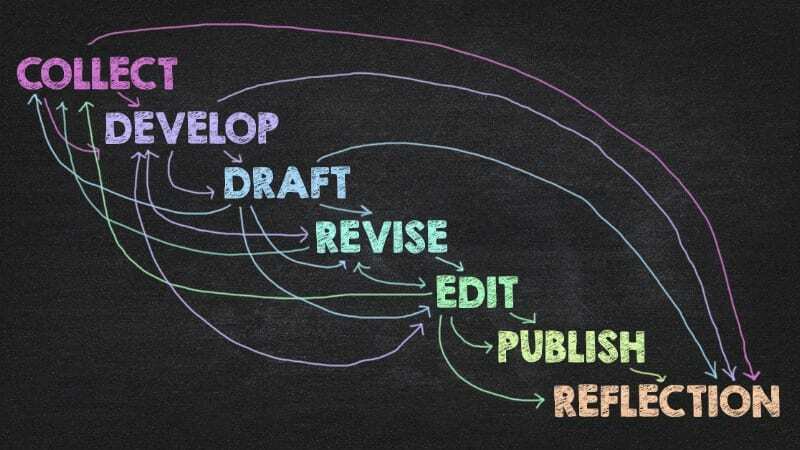 Sharing a visual like this is freeing since it helps kids understand that while we may occasionally move through the writing process quickly and in a linear fashion, it’s more likely (and perfectly okay) for the steps to become messy or muddled.